To continue the subject of Hanukkah-themed recycling crafts I started in the previous post, I'm sharing another Hanukkah Menorah idea. This one is made of recycled paper using the paper quilling technique from 1/4"- and 3/8"-wide strips (0.5cm and 1cm). First I planned to paint it silver, but then decided to leave it as is. This Menorah is approximately 5 inches (12.5cm) in height, I think it may be called "Mega-quilling" compared to the miniature quilled Hanukkah Menoras I made last year. Fabulous, Inna! It looks great. Inna, the beauty of your quilling artistry shines through no matter what the materials. 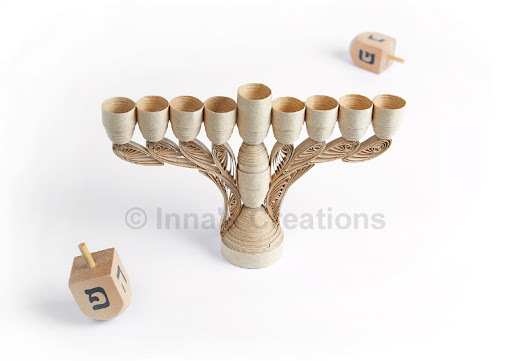 This Hanukkah Menorah is just lovely! Inna amazing work that too with recycled paper it is truly impressive. wow, what a beautiful work! Well done! !